Turns out Nicki Minaj is no stranger to controversy herself. If she got what she wanted, she would have performed at the VMA's on stage Monday night with controversial rapper 6ix9ine. 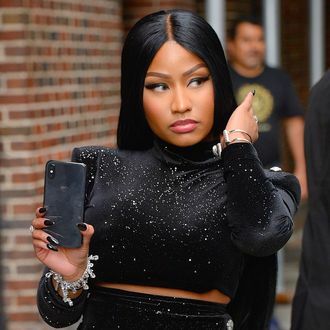 As she mentioned in episode 4 of "Queen Radio" Nicki revealed that she wanted to perform 6ix9ine's hit "FeFe" alongside him on stage, but despite her efforts, he was not approved to do the show. "I wanted him to perform with me at the VMAs and somewhere along the line he didn't get approved to perform by the powers that be," she said. "I don't want anyone to think for a second that I wouldn't invite him to perform his hit record. I want everyone to know my character. I really fought... When I know somebody there's nothing you can tell me about them." Nicki's Performance did feature her verse from "FeFe" as well as other songs from her recently released album "Queen", though some of her goodwill from the industry might be strained due to her wanting to work alongside 6ix9ine. Critiques coming her way due to the fact that 6ix9ine plead guilty to three felony counts of "use of a child in a sexual performance" back in 2015. I would imagine it has to do with his appearance. Though this is a bit unfair if you ask me. Lady Gag-me can dress up in an all meat dress and people eat it up but this dude dressed with too many colors and has too many tattoos on his face and suddenly it is a problem. Part of the reason he is famous is because of his style. I would imagine there is more to it than this. Like has he said anything or done anything controversial on social media prior to this? I don't think there was. I never got this either. Like he is a big name, looks aside, him and Nicki would have been great together performing at the show. I'll be real with you guys, I think the dude is trash. He banks on repetition and mumbling trap music. It has no depth and takes little talent. Sure, not all his tracks are this way but a lot of them are and to me, this kind of hurts hip hop. It is a good thing they didn't allow it. Nicki is better than him by far and don't need her image taken back cause of him. Everyone's standards when it comes to music these days have lowered. I can't be the only one seeing this. Like so many lyrics just don't make sense. Just because the beat is fire doesn't make it a good track. Don't care for the dude or his music but it was kind of crappy that they told Nicki no when she wanted him there. It'd be another story of she said no. Maybe they didn't want him taking some shine away from other people. Who really knows. Maybe we'll see him next year.